Olivewood Cemetery needs your help. Preserving the heritage of this historic site requires help from our extended communities working together. The Descendants of Olivewood coordinate and actively participate in a variety of important projects, some of which are described below. Please contact us by email or voicemail to tell us about the activities in which you or a group you represent would like to participate. We will do our best to integrate those with even the most restrictive schedules. Olivewood is located next to White Oak Bayou, and is therefore surrounded by lush flora. It only takes about a week in the summer for the cemetery to be overrun with vegetation. Beyond routine mowing and weeding, we try to beautify and restore the old landscaping that has changed with time. If you have a knack for clearing brush and landscaping areas that have been lost to time, you would certainly do well to join us on the first or third Saturday of the month. Check the events calendar to stay informed about upcoming events. We welcome individuals and groups for sponsored clean up days, or to join us for a general clean-up day. Please bring a completed volunteer waiver. 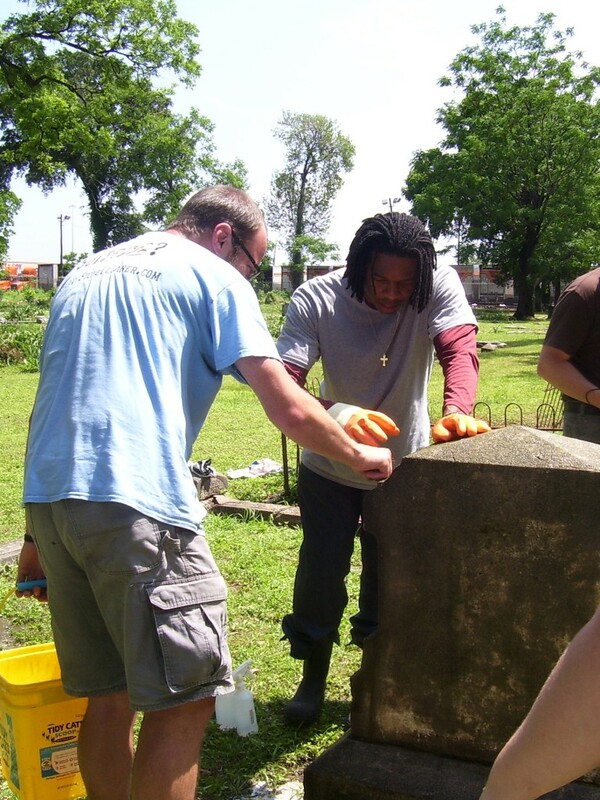 Volunteers cleaning a headstone using D2 cleaner. Many of our friends first discover Olivewood Cemetery in the process of doing genealogical research on their own. If you enjoy doing historical research or want to discover part of your own past, we welcome your help and can guide you to useful resources. Additionally you may be interested in our cemetery records database. If you would like to contribute your own genealogical research to fill gaps in our database or have questions about our research, please contact us. Our projects also include ongoing efforts to compile the information that we have collected about Olivewood. We are looking for individuals to participate in organizing this information into a curriculum to be used in schools and libraries. Olivewood Cemetery sits on a curve of White Oak Bayou and as a result is populated by a wide array of flora and fauna. We are working with volunteers to identify native and introduced plant species in the area so that we can provide educational materials to our visitors. These efforts also serve to help us protect as much native habitat as possible. As we clear more and more overgrowth from the full extent of the cemetery, we uncover gravesites that we have never seen before. We are working on GIS survey/mapping of all known gravesites, and need help with data collection and documenting this information. Olivewood Cemetery was established in 1875, and conducted burials through the 1950s. While the stories of many of the oldest of the interred have been lost, we hope to be able to capture as many stories of the rest of Olivewood’s residents as possible. To that end, we are searching for more descendants and relatives of those buried in Olivewood, as well as volunteers to help collect their stories. Some people are able to give, but others are good at “getting”. If you have ideas or skills in fundraising (event planning, grant writing, etc.) we can always use your help. We appreciate all of our donors and volunteers. Click to see a list of our contributors or our Bernice McBeth Service Award recipients. You may also use the short form below to start an email message (if you have an email client). Please watch the volunteer video and download our volunteer waiver before coming to the cemetery. We look forward to seeing you at our next event!